This is one of my all time pet peeves: Sponsors negotiating and leveraging their sponsorships in a disrespectful way. And the sponsees are just as bad, because they allow it! 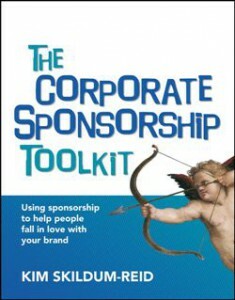 The most powerful thing that a sponsor can do to effect a marketing return from sponsorship is to add value to the event/cause/team/whatever experience – to amplify the good stuff and mitigate the bad stuff; to make it more accessible, convenient, or interactive; to give the target market more input, control, or voice; to make the target market feel understood and valued and respected. People choose to have these experiences – they care about them and make them part of their lives – and the sponsor who makes that even better for them will be valued and their contribution to the experience advocated. It’s about creating small, meaningful “wins” for a lot of people, and it is incredibly powerful. Contrast that with sponsors who take the selfish route – who choose to interrupt the experience, to be overbearing and intrusive, to disrespect the audience; who are so are so focused on getting people’s attention that they conveniently forget that those people are there for the primary goal of paying attention to something else. If you’re a fan of Super Rugby, as I am, you’ll be familiar with the Vero bull. And you’ll probably be equally annoyed that this bull “runs” right alongside the field of play over and over again, using electronic signage. Sounds pretty cool, until you realise it doesn’t stop when the game is happening and that it makes it really hard to follow a play when the background is moving, too. The resulting message I’ve got from Vero is that they are prepared to disrespect the precious time I spend watching my favourite team play by making it more difficult to follow the game. Thanks a bloody lot. Vero will never get my business. Then there is was the NBA All-Star Game in May. The superstars of the game played a game of HORSE – a game many of us played hundreds of times as kids. On one hand, that’s fantastic and brings a grassroots, nostalgic element that many of us can identify with to a very glamorous event. On the other, why did they have to replace the letters H-O-R-S-E with G-E-I-C-O? The biggest drawcard of that competition is the nostalgia, and Geico disrespected it. How is that good for the brand? How does that make people love that brand more? What if, instead, Geiko ran an online promotion to nominate and vote on a word to use instead of HORSE (or people could vote to just leave it as “HORSE”), or they created an interactive HORSE game on their website? What if, instead, Vero decided to stop the bull during play and show a static message like “Vero respects the game you love”? “Would I rather watch a nostalgic game the way it was meant to be played or turned into something that bears little resemblance to the game I played as a kid?. If you love the game, you want to watch the game. If HORSE is about nostalgia, then the nostalgia needs to be preserved.Anything else is disrespectful. And disrespecting someone’s experience may make them remember the brand, but it won’t be in a good way.